When I have created a design for Disc 1 and I'm ready to print, is there a way to automatically copy the entire design onto Disc 2 and print both at once? Or is there a 'duplicate disc' print option? In a previous version of AudioLabel, there used to be a duplicate disc version, now I can't seem to find it, and have to keep feeding in the paper and print one by one, changing Disc 1 from bottom to top, etc. AudioLabel version 5.0 has an option called "Disc Layout" where you can set the position of the disc(s) on the page, and also set a duplicate layout for either Disc 1 or Disc 2. 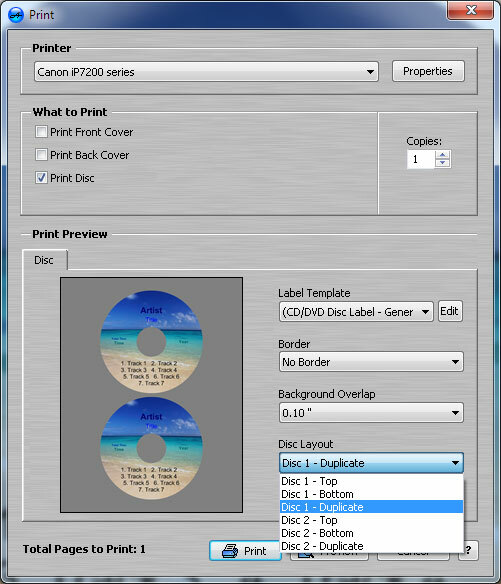 The Disc Layout option can be found in the "Print" dialog, under the "Disc" tab in the "Disc Layout" drop-down box (see image below). The Disc Layout option is also available on the "Properties" toolbar when the actual disc is selected on the view/screen of AudioLabel. If you are using an older version of AudioLabel, the Disc Layout options are a little different. In the older versions, the duplicate disc option is ONLY available if your project was started in "Single Disc" mode (instead of "Double Disc" mode). If you have an older version, you can start your project in "Single Disc" mode by selecting "New" from the "File" menu, and then selecting a single disc template (either CD or DVD). In AudioLabel version 5.0 the duplicate disc option is available for Disc 1 and Disc 2, and you can also switch between "Single Disc" mode and "Double Disc" mode without starting a new project.